Evaporative condenser is a very efficient way to heat. Heat is rejected at a lower temperature than with conventional air cooling and less fan power is not required. 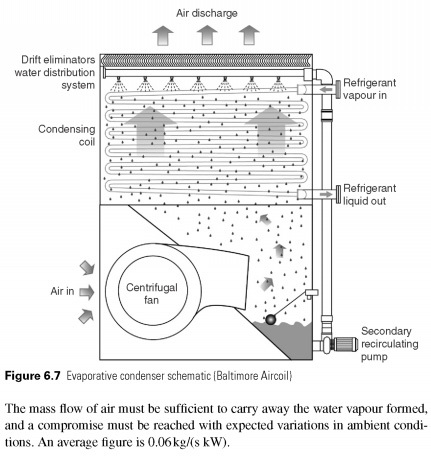 The cooling effect of evaporation of water is applied directly to the condenser refrigerant pipes in evaporative condenser (Fig. 6.7) . Mass flow of water through the condenser tubes should be sufficient moisture surface of the tube, and will be of the order of 80-160 times the amount of the evaporated. Mass air flow should be sufficient to attract water vapor is formed, and a compromise must be reached with the expected changes in the state of the environment. The average figure is 0.06 kg/s kW). 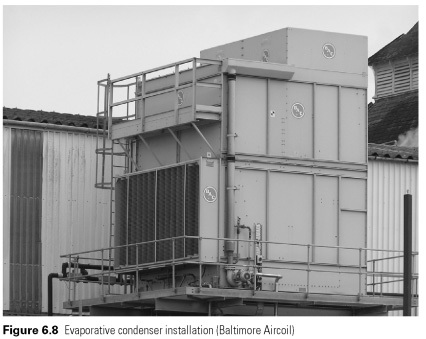 Evaporative condensers have a high resistance to air flow than cooling towers and centrifugal fans are often used, are grouped together to obtain the necessary mass flow without excessive size. This arrangement also quieter than axial fans. Most species are forced draught fans (Figures 6.7 and 6.8). Cooling towers and evaporative condensers may freeze during winter, if left running on mild exertion. General arrangement, to turn off the fan(s) with the thermostat to prevent ice formation. -The water in the well will immersion heater to reduce the risk of freezing, when not in use, or tank can be located inside the building under the tower structures, if such a space is conveniently available. Materials should be resistant to corrosion. The steel must be hot galvanized, although some resins, coatings may be sufficient. GRP casings are used by some manufacturers. Water-acceleration package cooling tower made of wood, whether or corrugated plastic sheet.